Sodium/hydrogen transporters transfer ions across membranes and thus play an important role in pH and electrolyte homeostasis. To further understand the mechanism and function of the plant vacuolar Na+/H+, a new Na+/H+ antiporter, named DmNHX1, was isolated from chrysanthemum (Dendranthema morifolium) and characterized. The total length of DmNHX1 is 1,897 bp, with an open reading frame of 1,653 bp. Functional complementation studies in Saccharomyces cerevisiae strains with mutated endogenous NHX genes showed that the encoded protein, DmNHX1, has a broad cation specificity (Na+, K+, Li+) and confered hygromycin B tolerance. Quantitative RT-PCR revealed that the transcription level of DmNHX1 was induced by salt stress in all studied tissues, especially expressed highest in the leaves. 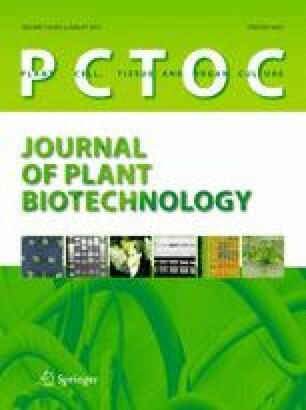 Agrobacterium-mediated transient expression of DmNHX1 in Nicotiana benthamiana enhanced the salt tolerance of leaf discs, as indicated by reduced bleaching and increased chlorophyll content when compared to that of controls. In addition, overexpressing DmNHX1 resulted in enhanced salinity tolerance in transgenic Arabidopsis thaliana. Our studies suggest that DmNHX1 plays the crucial role in salt transport of chrysanthemum and could be applied for the improvement of salt tolerance. Hui Zhang and Yaxin Liu are the co-first authors. We thank The James Hutton Institute for excellent glasshouse supplement; and the academic visit opportunity from China Scholarship Council. This work was supported by the grant of Innovation Fund of Shanghai Municipal Education Commission.